The SS Dorchester was sailing through the frigid waters of the North Atlantic in the predawn hours of February 3, 1943. 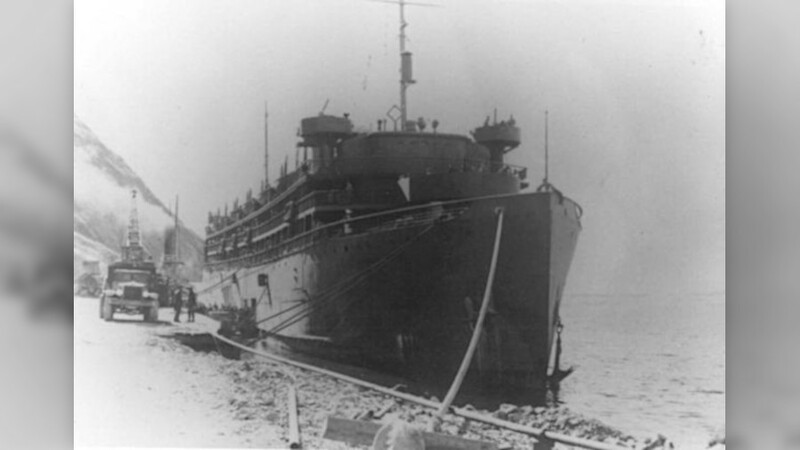 Once a luxury cruise ship, the Dorchester had been converted into an U.S. Army troop-transport vessel to support the war effort. She departed Newfoundland carrying 902 men (most of them soldiers and sailors) and steamed north toward Greenland. But she never made it. Like many other transport ships during World War II, she was stalked and sunk by a German submarine. The crew and men of the Dorchester knew the risk. In fact, as the National Museum of the United States Army (NMUSA) explains, the ship’s captain had ordered all onboard to keep their life-vests on, even as they slept. But many soldiers and sailors failed to heed his order and warning. German submarine U-233 would claim the Dorchester. The sub fired a volley of three torpedoes just after midnight. One of those torpedoes found its target and gashed the Dorchester’s starboard side. Those who survived the initial blast would endure a night of hell — and then catch a glimpse of heaven. Those who survived the initial blast would endure a night of hell — the flames of a dying Dorchester, the frigid waters of the Atlantic, the din and chaos of combat — and then catch a glimpse of heaven. That’s what makes the Dorchester’s sinking different than that of other ships lost crossing the Atlantic during World War II. That glimpse of heaven in the middle of hell was provided by four Army chaplains: Lt. John Washington, Lt. Alexander Goode, Lt. George Fox and Lt. Clark Poling — a Catholic, a Jew and two Protestants. From left to right: Lt. John Washington, Lt. Alexander Goode, Lt. George Fox and Lt. Clark Poling. But on February 3, 1943, each chaplain was exactly where he was supposed to be. As the Four Chaplains Memorial Foundation details, the “chaplains spread out among the soldiers … tried to calm the frightened, tend the wounded and guide the disoriented toward safety.” They made their way to a storage locker and began distributing the emergency life jackets stowed there. Father Washington “gave absolution to soldiers as they went over the side,” according to NMUSA’s history of the Dorchester. When Lt. John Mahoney tried to return to his quarters to retrieve his gloves, NMUSA reports, Rabbi Goode told the young sailor, “I have another pair. You can have these.” Only later did Mahoney realize that Rabbi Goode had given the young sailor his only pair of gloves. The Four Chaplains “seemed to be everywhere on the deck until the very end,” NMUSA explains, quoting from the recollections of several survivors. They were angels ministering to the needs — physical, spiritual, emotional — of men thrust into combat. And when there were no more lifejackets, “the chaplains removed theirs and gave them to four frightened young men,” as the Four Chaplains Memorial Foundation poignantly recounts. Read that again: These four heroes held onto their brothers, leaned into their fate and reached out to their God. The story of the Four Chaplains is more than an inspiring example of wartime courage; it’s a timeless parable pointing us toward four deeper truths. Recall that the men were ordered to wear their lifejackets, but many ignored that order. The Four Chaplains heeded the captain’s warning, and because they did, they were able to bring calm where there was chaos, hope where there was fear, life where there was certain death. They quite literally preserved the lives of others. All of us are traveling through dangerous waters. The enemy, the storms and the chaos of this world will affect us all. The question is this: Are we covered, like the chaplains, by the assurance and certainty of the One who can carry us through the chaos of this life into the next? In how they lived and how they died, the chaplains remind us that God wants to use us right where we are. Because they were faithful and obedient, God used them — not just in those terrifying, unmeasured moments after the torpedo ripped through the Dorchester, but also in the example they gave as they died and in the stories told about them. Their example would live on in the memory and conscience of every survivor. And those stories continue to serve as a lesson for us. In how they lived and how they died, the chaplains remind us that God wants to use us right where we are — and that what seems insignificant for us may have an eternal impact for someone else. The Four Chaplains “spread out among the soldiers … tried to calm the frightened, tend the wounded … guide the disoriented toward safety … and began distributing life jackets.” They saved four lives directly. And only heaven knows how many of the 230 who survived the Dorchester were saved because of their presence of mind to find the storage locker and calmly pass out extra life-vests — or how many souls were saved by their prayers. Are we not called to do this in our daily lives? The Lord asks us — commands us — to spread out and share His good news, good news that brings hope and life. The Lord asks us — commands us — to tend to the hurting and guide the lost toward the safety of His arms.